Tomorrow is St. Patrick's Day, and you folks know that I couldn't pass up the opportunity to do some holiday themed nail art! I went all out this year, including shamrocks, rainbows, and lots of sparkly gold in this double accent manicure. 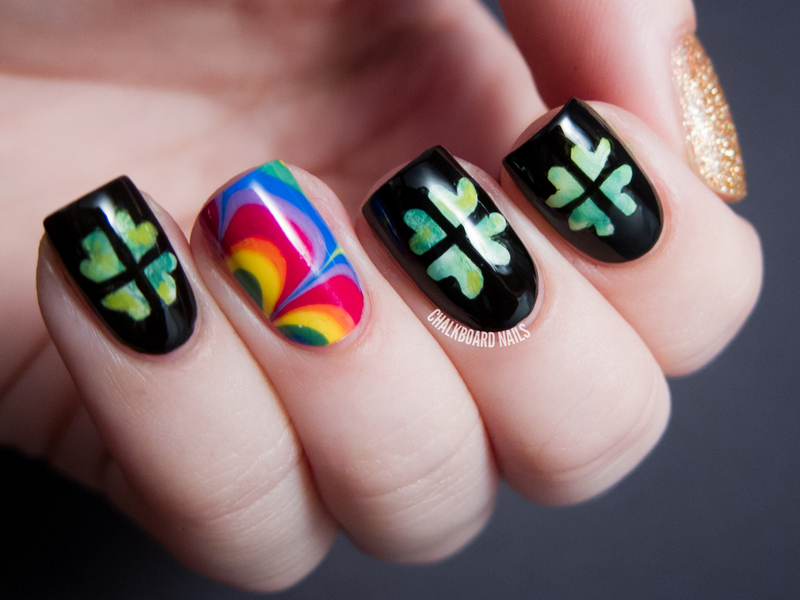 The shamrock nails were the most difficult to execute. I began with a white base and then watercolored three shades of green over it: China Glaze Gaga For Green, China Glaze I'm With the Lifeguard, and OPI Jade Is the New Black. After giving that a chance to set, I painted a black cross down the middle of the nail and used them to form heart outlines (check out my Instagram for a visual). 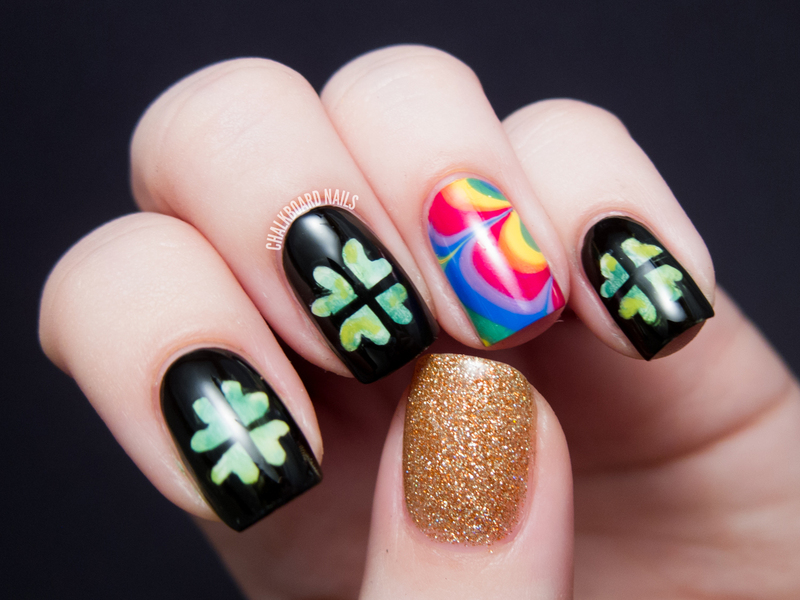 Then I just filled in the rest of the nail with more black, leaving the shamrock cutouts! 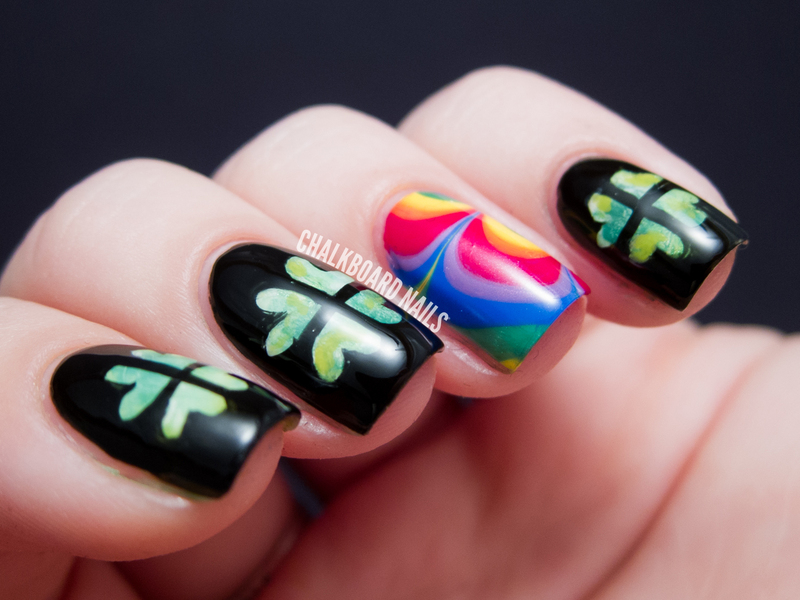 The rainbow nail was water marbled. The colors I used are: China Glaze Adventure Red-y, OPI In My Back Pocket, China Glaze Happy Go Lucky, Sally Hansen Going Green, Sally Hansen Pacific Blue, and Sally Hansen Violet Voltage. It took me a couple of tries to get a marble pattern that I was happy with, but I'm glad I was persistent because I like the way it came out! Of course, I had to get some gold in there. 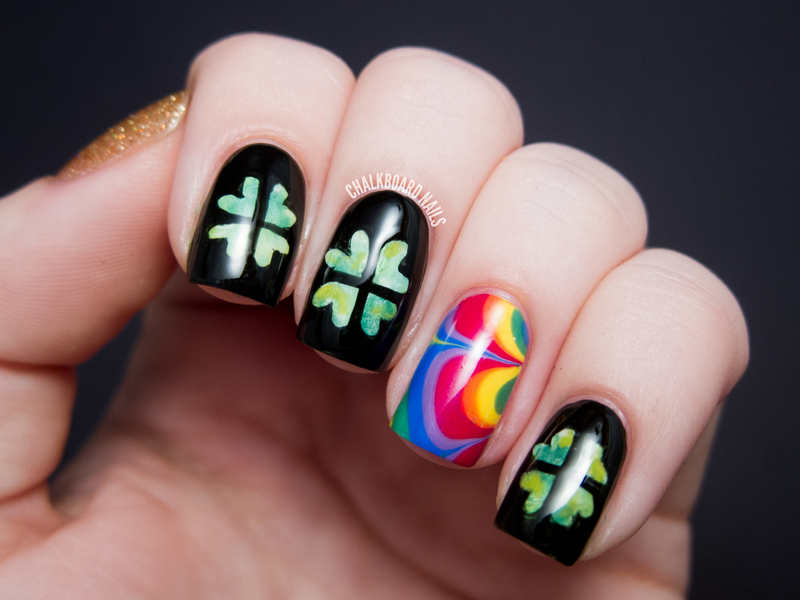 What's a St. Patrick's Day manicure without gold? I grabbed China Glaze I Herd That and covered my thumb in its glittery majesty. Did you do anything special on your nails for the holiday? Some of the products in this post were provided to me for review consideration. Omg, that rainbow marble is to die for! I might have to re-attempt one soon now I think. Ohmygoodness - your rainbow water marble is absolutely AMAZING!! And I'd never seen a mani with CG I Herd That that I liked...until today! Love love love...this is so clever! I always forget gold when I think of St Patty's day but this was awesome!!! Get outta here!! This is AMAZING :D Wonderful job! I love the rainbow nail, I really need to give water marbling another go, my first attempt was a disaster! Lovely! I wish I could do stuff like this. I have Color Club Wild Cactus on my nails atm. Love the green but it stains pretty good. I need to get some vaseline and I keep forgetting. 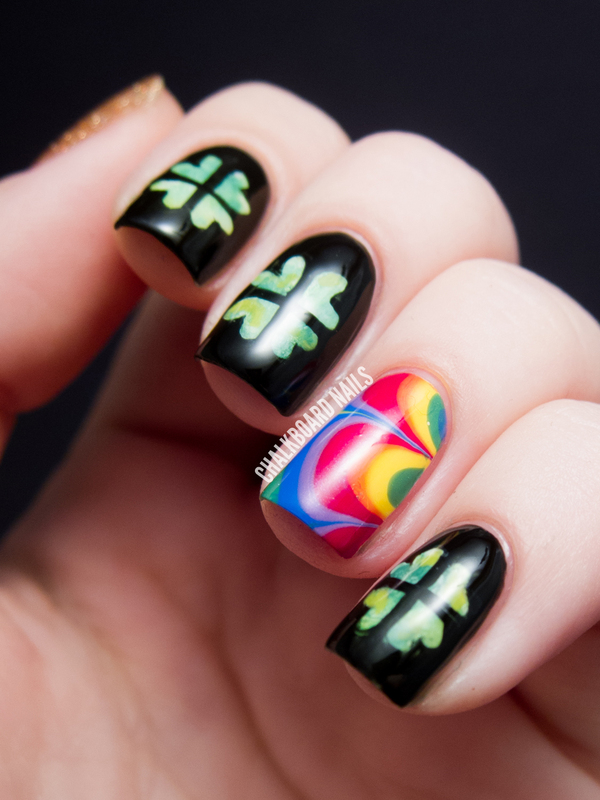 These is the best Patty Day nails I have seen this season! I like the rainbow the most:-)!! Wow, this is beautiful. I love every single thing about it, the rainbow, the clovers, the gold. It's gorgeous! Love it! You always do such flawless manicures! I am in love with these nails!! This is awesome!! What an awesome idea for the shamrocks!! your water marble is perfect! You said: "Thank you for taking the time to comment. I truly do appreciate each and every one of them. :)" , but you remove a comment. That´s nice. You know what, Another person Point the same thing as I do, and you don´t delete it. So...The one that´s offensive is you. I will check your blog again. Good luck! Hi Kelly, thanks for commenting. After receiving your first comments, I removed the photos that you found offensive. At that point, I considered the matter resolved and removed your comments to avoid confusion for others visiting the page and reading the comments. 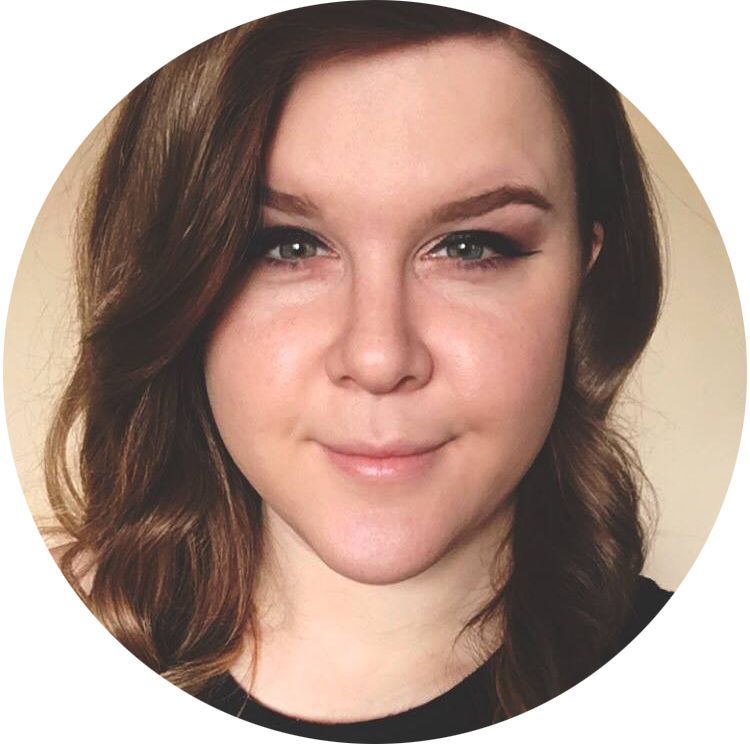 When the first person pointed out the issue, I didn't remove my photos because I wasn't sure that I needed to. After two people (the first person and you) had mentioned it, I figured it was best to just take them down. You're right in that I should have removed her comment too. I'll be honest -- I didn't even think of it, and that's why her comment was still up. I would appreciate it if any further comments were written without this hostility.